To ensure law enforcement officers receive comfortable, secure hand protection, TurtleSkin glove sizing is based on accurate hand measurements. Most of our gloves come in six sizes to precisely match the needs of a diverse law enforcement workforce. 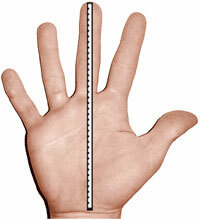 Use the following measurements to determine correct glove size for proper hand protection. NOTE: Use the longest "finger length" or "hand width" measurement to find your accurate glove size in the charts found below. If your longest measurement falls between sizes, order the larger glove size. 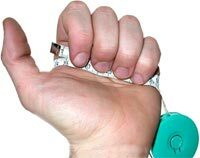 Length Measurement: Measure from bottom edge of palm to the tip of your middle finger to determine your finger-length size.